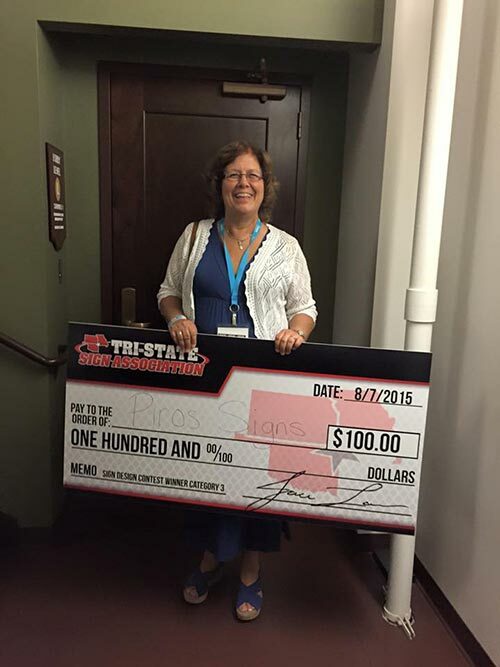 2 weeks ago was the 5th Annual Tri-State sign expo in Joplin, MO. 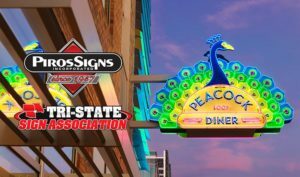 Tri-State is an association that targets the advancement of the sign industry in Missouri, Oklahoma & Kansas. The Peacock Diner neon sign captured the crown in Category 3. Which is Illuminated or Non-Illuminated Wall Signs. (Including channel letters, sandblasted signs, mod, 3d routed hdu signs, wall mounted dimensional letters and graphics). Below is Cyndy Brand AKA Mrs. Piros herself accepting the award.